If you just need a simple chart, graph, or other image created to add to a business presentation, proposal, or the newest page on your website, have you ever wished that you could do it yourself? GIMP – GIMP is a free open-source image editing program that is similar in capability to Adobe Photoshop. It is a primarily desktop-based program that can work on Windows, Mac, and Unix operating systems. Creately – Creately can be used to build diagrams, flowcharts, and more. Multiple users can collaborate on a file or design, and saving or sharing files is easy. Creately offers desktop and browser-based package options. Infogram – Infogram can be used to create simple infographics and charts or graphs. It is a browser-based service and offers its services for free. Piktochart – Piktochart enables users to create charts, infographics, and much more. Using simple drag and drop functionality Piktochart makes graphic creation quick and easy. Piktochart is browser-based and offers different monthly packages for students, non-profits, personal / small-time users, and pro or business users. Easelly – Still in beta, this infographic creator allows for registration, completion of a survey, and the option to view graphics created using the service’s infographic builder. Creating your own graphics can be fun and rewarding, and if you need a simple graphic quickly some of these services might be a great fit for your business now and in the future. When creating anything more than a simple graphic it is best to have a professional on hand, even if they are only acting in a consultant capacity. Images can have a big impact on consumers; from first impressions about your website to choices regarding your products and services, online graphics carry more weight than many people realize. Because of this it is important to know when a project is best left in the capable hands of a professional graphic designer. The services and programs we’ve mentioned here are only a few of the possibilities that await you. There are dozens of data visualization services on the web that can help you create your own business graphics quickly and easily. It is important to remember that there are a number of psychological factors that go into creating the perfect professional infographic, and as such more complex imagery or interactive graphics should involve a professional designer, if only to get their input on the potential effectiveness of your work. 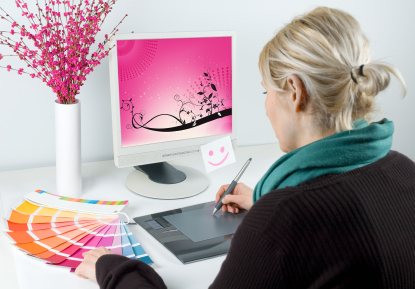 How does your business handle the creation of any needed graphics? Do you work on them yourself, or do you hire a professional designer?